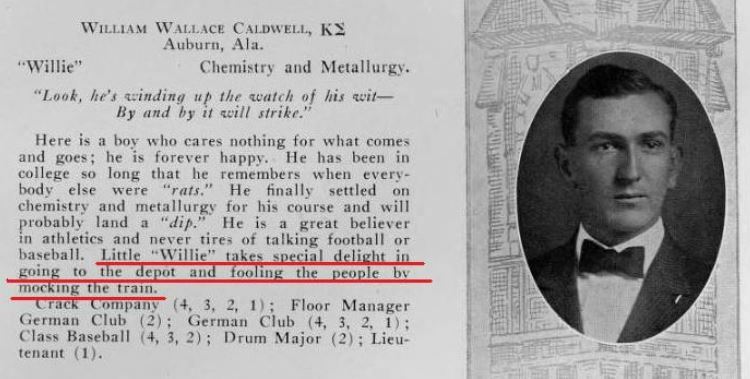 In a previous post, I described the chaotic night that Auburn’s head football coach resigned at a pep rally the night before the Florida game in the dismal season of 1927. 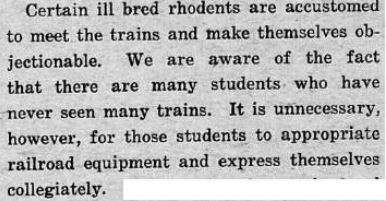 A throng of students left campus that night and created mayhem in the loveliest village. In addition to starting a bonfire in the middle of the street at Toomer’s Corner, a few students made their way to the train station with mischief on their minds. 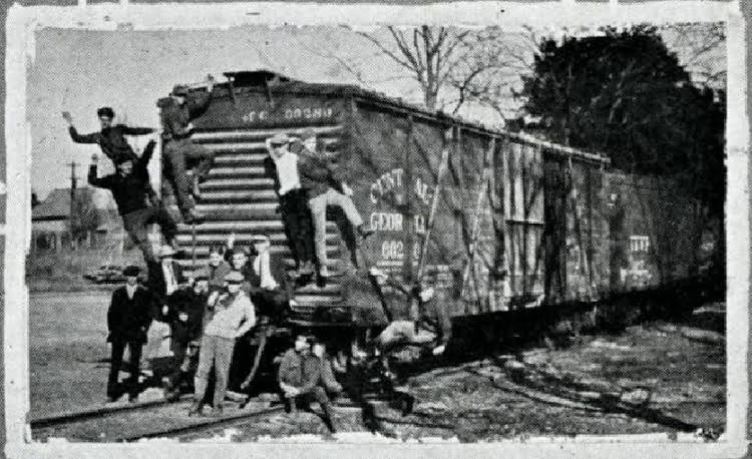 A group of students in 1928 about to “hobo” a freight train to watch Auburn play a basketball game in Atlanta, from the Auburn Digital Archive. 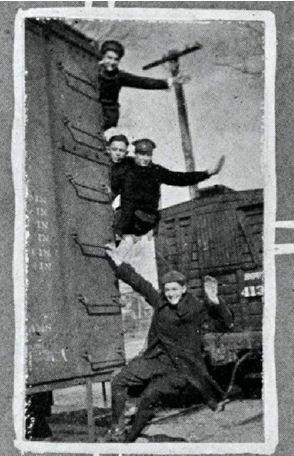 The events at the train station on the night of October 7, 1927, exceeded all previous tomfoolery by far. A crowd of students met the No. 36 train when it stopped at 8 p.m.. For a few minutes, the students commandeered the train and teased the passengers, but most noteworthy was what they were wearing. You can imagine how embarrassed Auburn people were about this incident. 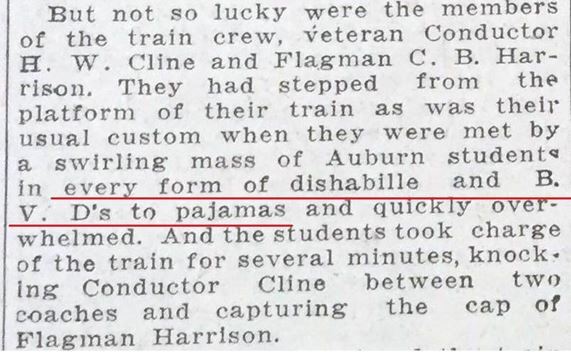 The Advertiser made clear that such behavior was not typical of Auburn students. Michael Strickland (AU ’97 & ’98) lives in Murfreesboro, TN with his wife, Mary (AU ’98) and three kids, who really hope to get in-state tuition some day. He has a PhD in Theology from the University of Birmingham, England, (and is not afraid to use it) and is Assistant Professor of Theology at Amridge University. Michael is from Moulton, AL, a town older than the state (seriously). 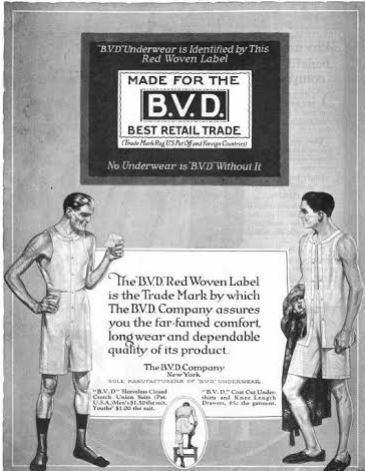 He has never boarded a train in his underwear, though there were a couple of times he almost lost his religion waiting for trains to pass in Auburn. He has a fairly boring website: professorstrickland.com. He tweets at @stricm3, and will give a free ice cream cone to his 10,000th follower. 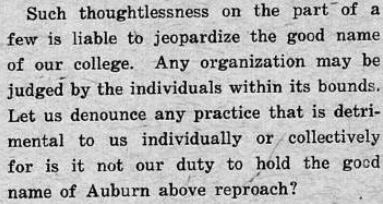 Related: That time Auburn students burned a Toomer’s oak. Love the story bust curious but does anyone know any details about what is happening over at the train station now? Is it being restored/used for something soonish? Would love to know I pass by it every day. Gosh dang it, I love Auburn.